Or, upload your own design. You can do this on the next page. Our beautiful mens signet rings are exclusively supplied by Hancocks of London, the world famous firm of English jewellers. Males have been wearing seal engraved rings since antiquity to display status and rank. With the advent of heraldry in the middle ages, rings have been seal engraved with crests, the heraldic symbols of individual families. The rings were designed to make a personal sign in wax on letters or documents so became known as signet rings. The gift of a signet ring - with the grant to show his coat of arms or crest - was a rite of passage for a young man. Today, they are an elegant expression of individual style as well as a bespoke link to a family’s past. Hancocks have supplied mens gold and gem set signet rings and cufflinks since 1849, making the firm probably the world's longest continuous supplier of these traditional English jewels. Today, wherever you are, you can join that history by ordering the classic style Oxford oval signet ring engraved with your family crest directly from Hancocks at myfamilysilver.com. Add your motto to your crest or engrave a personal message inside your ring for that extra special touch. Gold is the traditional choice for signet rings. Our rings are produced in 9ct, 14ct and 18ct gold. For information on which standard of gold to choose click here. 18ct gold is the most popular option with our customers. We also produce rings in rose gold and white gold. These variations are achieved by alloying gold with other metals, usually palladium and silver for white gold and nickel, copper and zinc for rose gold. White precious metal signet rings are another popular option. Silver can be used as a cost effective option but it will tarnish and is not particularly durable. Platinum is a much more durable metal, it produces a beautiful, lightweight ring which will not tarnish. Which ever precious metal you choose your ring will be skilfully crafted in our workshops with the utmost care and attention to detail. Which standard of gold should I choose for my signet ring? We are often asked which type of gold is best for a signet ring. Apart from price, the difference between 9ct, 14ct and 18ct gold is the standard of gold purity. 18ct gold is the most popular option with our customers. 9ct gold is 37.5% pure gold, 14ct is 62.5% pure gold and 18ct is 75% pure gold. The rest is a mixture of metals to give strength, durability and colour (particularly for white gold) to the alloy. All standards of gold display a crisp and detailed seal engraving and all our rings will give more than a lifetime's service. However, as gold is a relatively soft metal, over time 14ct and 18ct gold rings may show more wear than 9ct. They are also richer or more "golden" in colour as the gold content is higher. Interestingly, this is an appearance which gradually increases over many years as the pure gold migrates to the surface of the ring. Can I visit Hancocks to try rings on? Of course you are very welcome. Please call us on +44 (020) 7493 8904 or email [email protected] to make an appointment to visit our shop in London's famous Burlington Arcade. How long will it take to make my signet ring? Can I have a message engraved as well? Yes, we can engrave a message or date inside the band of the ring, see the order page for details. Can I have a different style of signet ring? Yes, we can be very flexible. Almost anything is possible! Delivery is by Royal Mail Special Delivery and costs from £7.50 within the UK. Overseas delivery is by international shipper at a variable charge – this will be shown on your basket page. All our deliveries in the UK and overseas are fully insured. Every signet ring comes boxed and with a wax impression of its seal engraving for you to keep. If I am not happy with my signet ring can I return it? As your signet ring will be made, sized and engraved especially for you, you will understand that we cannot offer a full refund, credit or exchange if you have second thoughts. However, we are happy to refund, or credit, the prevailing value of the precious metal if the ring is returned to us within 28 days. Of course, in the very unlikely event that your signet ring is damaged or faulty, we will offer you a full refund, exchange or credit so long as the ring is returned to us in an unused condition within 28 days. We also cannot guarantee that your signet ring will be the perfect size. We can supply a ring sizer by post. We usually re-size returned rings without difficulty and for free within 7 days, or later for a minimum charge of £35.00. We are delighted with Matthew's gold signet ring. The detail is amazing. Thank you. I hope the pictures are of good enough quality for you. Just wanted to let you know my brother and I received our gold signet rings yesterday for our birthdays. They are sensational! I can't believe the amount of detail on them, the weight is fantastic and fits perfectly. Very, very happy boys indeed! I have one question, which way is the ring traditionally worn? I guess it's down to preference? I am currently wearing mine like this. Not looking to take it off any time soon! Many thanks for all your help. Gareth I just wanted to give you some feedback. I am over the moon with my signet ring with crest, it's even better than I expected. Thank you for your good service, I would highly recommend 'myfamilysilver' to anyone! Jo Wow! What an absolutely beautiful godl signet ring! Fred is over the moon (and its a relief to see him wearing jewellery that doesn't turn his skin green!). You have done an incredible job - Nick is sick with envy and so I think we will be replacing his signet ring and he is after a pair of the stunning cufflinks in gold. so I may well be rushing a couple of orders through before Christmas. Just to say thank you very much for the work your team did on engraving my ring. I am so happy with the results Mand will definitely be sending other family members in your direction. My gold signet ring has arrived safe and sound. It's beautiful, thank you so much. What a professional company. I will totally recommend you to all. With kind regards Sarah (Suffolk) I have just received my signet ring from My Family Silver, I would just like to thank you on an amazing customer service and a prompt delivery. I couldn't be happier with my perches!!! You are true pros and I will definitely be recommending you to my family and friends!! Many thanks Richard (Hertfordshire) Received the signet ring last week in time for our anniversary. Wife is thrilled as it fits beautifully. Thanks. Stephen, I just wanted to say thank you! The ring I picked up on Friday is perfect – I am delighted with the quality of work and the overall end product and appreciate how you handled this matter for me. Alan Monro (Surrey) Thank you so much for speeding through my order, delighted with the signet ring. I'm very happy to promote your excellent site to other boys at Cheltenham College. Kind regards Helen McEvoy Your ring is perfect - very beautiful and fits! Many thanks for your amazingly quick delivery of the engraved signet ring for my daughters 18th birthday. Thank you so much, its perfect, arriving this morning in time for the party on Saturday. I collected my signet ring today and wanted to say just how pleased I am with the lovely quality and finish. It was absolutely worth the time and effort it took to deliberate which gold (the 18ct rose looks absolutely gorgeous), and to get the crest design just right. I am particularly pleased with the lovely engraving of the archer and the Xhosa inside the band. I have a beautiful, personal piece of jewellery that reflects my family heritage and which I will have for life and be able to pass on. Thank you all so much, and please pass on my sincere thanks to the engraver. Many thanks for all your help arranging my son's gold signet ring for his 18th birthday. Your help with the design and the fast turnaround by your workshop was first rate. I am absolutely delighted with the ring itself and the quality of the engraving. It's been a pleasure dealing with myfamilysilver.com and I'll certainly be using you again. All our signet rings are bespoke and seal engraved for us by the best craftsmen using traditional goldsmithing techniques. We believe that a once in a lifetime purchase should be unique, timeless and worth every effort. All our signet rings are carefully made by die stamping to produce a dense, highly durable ring with a beautiful, clean surface for our highly skilled engravers to work on. Your chosen family crest is seal engraved in reverse in intricate detail by highly skilled craftsmen. This produces a 3D image when pressed in sealing wax. A reminder that the historic purpose of a signet ring was to seal letters and documents. Every engraving is unique and displays wonderful detail and astonishing artistic skill. The Hancocks' story began over 150 years ago. 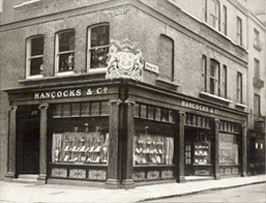 Its first home was the corner of Bruton and Bond Street and the fledging firm soon acquired a magnificent reputation, becoming a leading centre for the purchase of fine jewels and silver. Documented in a company diary, we learn that less than a year after his business had been established; Mr C.F Hancock received a warrant of appointment from Queen Victoria. She and many of the principle sovereigns of Europe became regular patrons. In 1856, Hancocks was instructed to produce the Queen's new medal, the Victoria Cross. This is an honour upheld by the firm today. Today the company is still family owned. 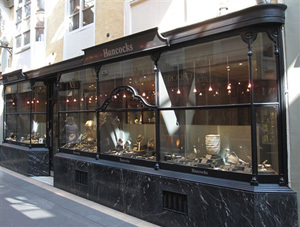 Stephen and Janie Burton bought the business in 1992 and moved Hancocks into its current location in the Burlington Arcade.